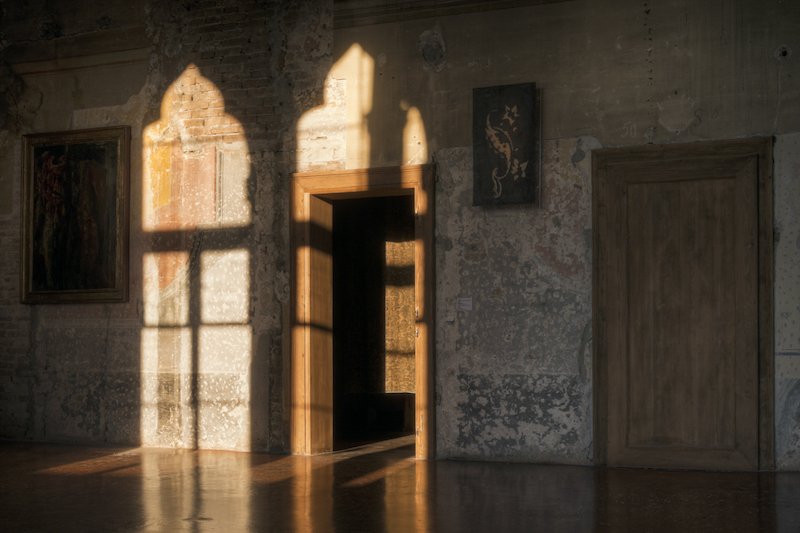 Mariano Fortuny was a true uomo universale: a painter, photographer, fashion designer, and inventor of stage lighting and the dimmer switch. If you visit his palazzo In Venice you realise, as you time-travel into a dramatic art nouveau world of sumptuous wall hangings, paintings, huge tasselled lamp shades and dark furniture, that he was in fact a genius. It’s said that Fortuny had a fear of horses and so the family next moved to Venice, being the only city where horses were not used for transport. He began painting in his new studio, the Palazzo Pisano-Orfei, experimenting with techniques for engraving (adapting a dentist’s drill) and creating colours from natural pigments, subsequently taking up photography after the invention of the Kodak panoramic camera in 1896. 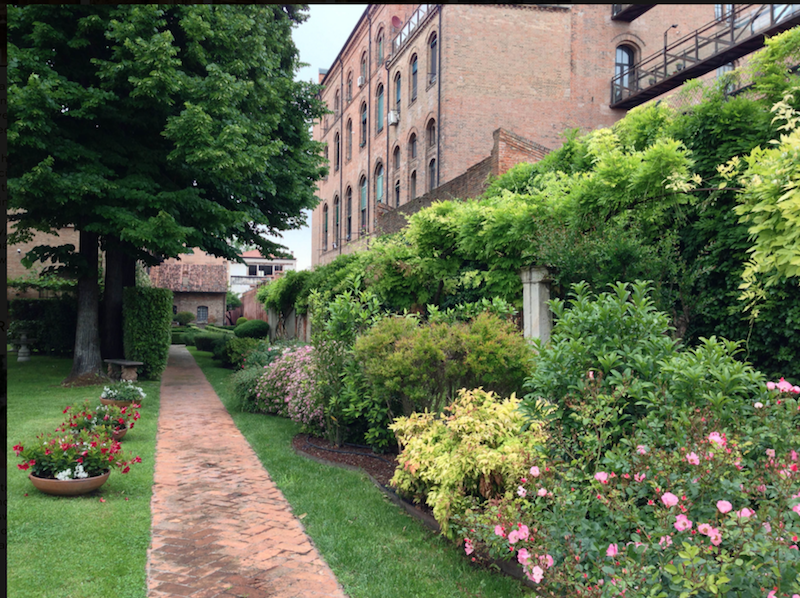 What is now the Fortuny Museum became a kind of magical workshop, still almost exactly as it was in his day. 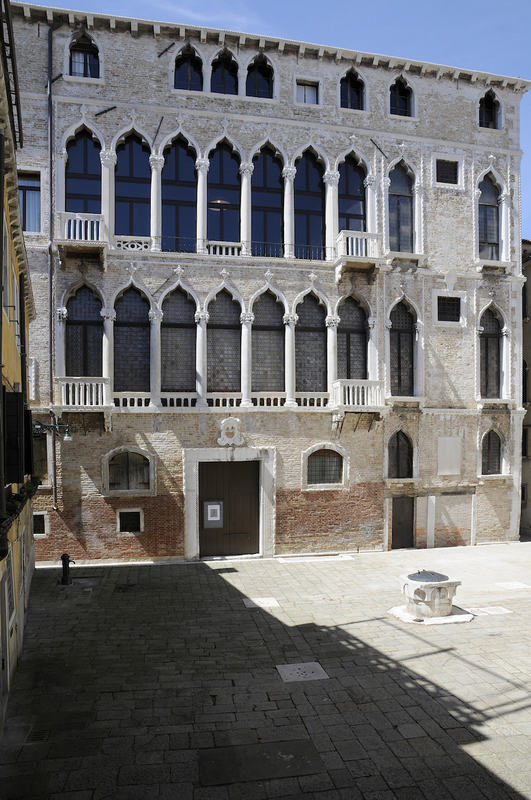 The Palazzo Orfei is visited by thousands of tourists every year, but very few realise that there is another Fortuny treasure in Venice, to be visited only by appointment, on the island of Giudecca. 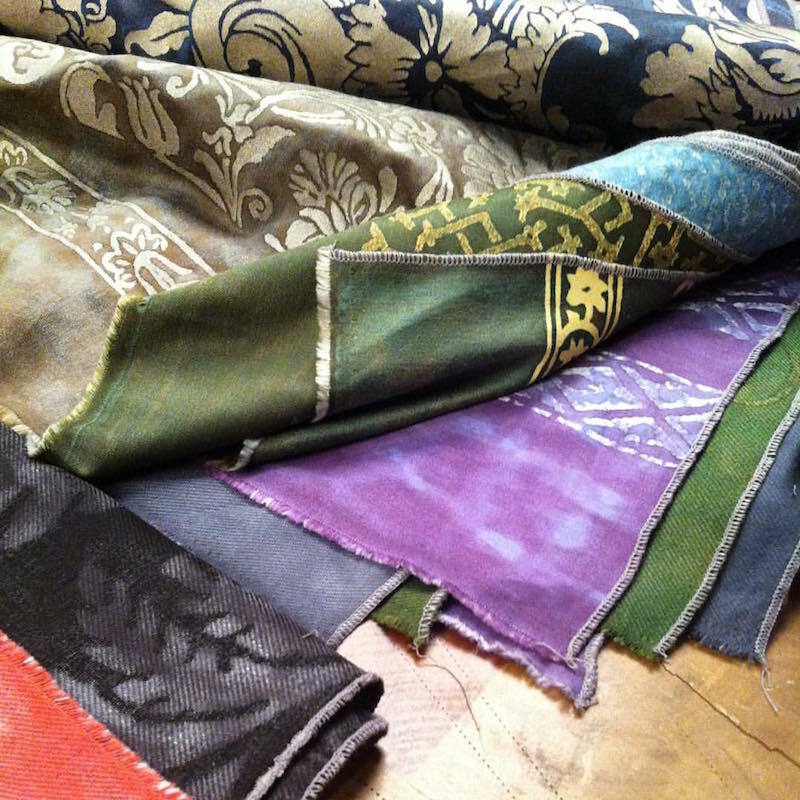 In 1907 Fortuny entered the fashion industry and began work on the textiles which are still manufactured today. If you take the vaporetto to Palanca and walk along the waterfront towards the amazing huge Gothic flour mill, the Stucky (now the Hilton Hotel) you come to a modest low brick building next door. Ring the brass bell labelled Fortuny and the door will click open (if you have an appointment) to admit you to a world of gleaming floor-to-ceiling bolts of cloth, and pieces of shimmering material hung like banners to show off the exotic patterns and colours. Every roll of fabric is a unique work of art, some with contrasting patterned borders, some with reversible colours and designs. The guides are very knowledgeable (and Laura speaks very good English) but there are certain questions which they cannot answer. The production of his textiles was the culmination of Fortuny’s work on engineering, colour and design. The machines on which the material was woven are above the showroom, a closely guarded secret known only to the dozen or so workers who operated them. It is still exactly the same today: no one is allowed to see the weaving process. In fact there were once rumours of sorcery and magic because his fabrics were so rare and beautiful. 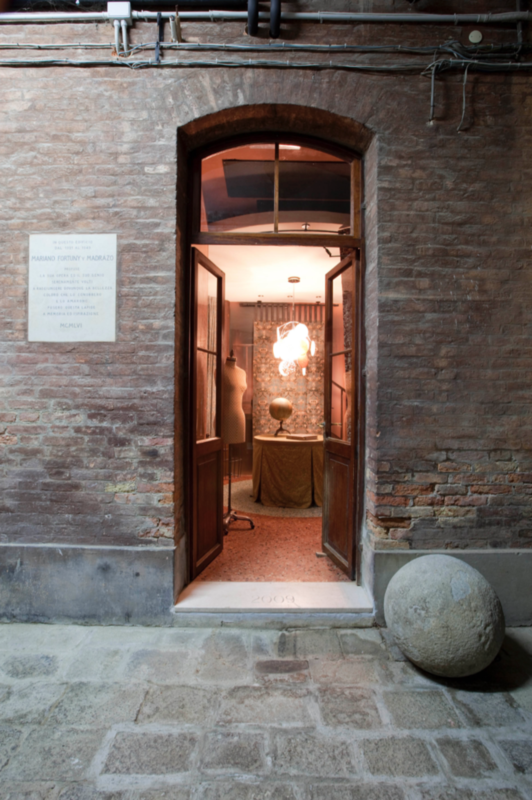 Behind the workshop and showroom is one of Venice’s hidden gardens. First, you enter a courtyard with a central well and jasmine covering the high walls. The formal garden edged with box hedges leads to an English rose garden and, perhaps surprisingly, a swimming pool. This is still used by the Riad family who inherited the Fortuny fortune and continue the tradition. Mariano Fortuny had no heirs, but left everything to an American woman who had become a devotee of his work. In turn she left the estate to her Egyptian lawyer and confidant, and his family carries on the tradition, jealously guarding the production secrets. Fortuny drew his inspiration for designs from his travels. There are patterns from Morocco, Portugal, Aztecs and Incas, maps of islands, and sinewy flowers reminiscent of the work of William Morris. Standing on one side of a length of cloth, a certain colour will predominate, but moving to the other side will produce a completely contrasting shade. One certain fabric of silver, white and blue threads was, we were told, inspired by the Gesuiti, one of Venice’s baroque churches. It seemed compulsory to go to see it when the visit was over. Two vaporetto rides later, we found ourselves in front of the extravagant white façade of the Gesuiti, paid our €1 entry fee, and went inside. What an extraordinary sight! A sea of blue and white patterns, on the walls, the columns, the altar steps and around the pulpit. It looks at first like exotic expensive wallpaper, but on closer inspection you can see that the patterns are made not of painted marble, but of millions of tiny marble tesserae which glisten in rays of sunlight. Marble “curtains” are realistically draped around the pulpit, and the stairs in front of the altar could be mistaken for a folded carpet. Fortuny died in 1949 in economic difficulty, but a genius ahead of his time. Now at last we can appreciate fully his inventive spirit and the beauty he created.